Billions of dollars are now being spent annually on alternative energy research. Some of us have been living almost entirely on renewable energy for years. However, all this research is making our lives a little easier. New and improved products are emerging thick and fast, fuelled by the now much larger market created by the green wave. Battery technology is one of the areas that is receiving a lot of attention. In reality, the lead-acid battery has not changed much in the last 100 years. Sulphuric acid in contact with lead plates has been starting our cars since we put away our crank handles in the 1920’s. In recent years we have seen the emergence of a number of new battery technologies. The vast majority of the focus has been on the energy-storage-to-weight-ratio issues. Clearly lead-acid is not going to win this race. Electric cars, notebook computers and even the latest high powered battery tools are all driven by lithium-ion batteries. Currently there are no readily available lithium-ion battery systems available for motorhomes, and even if there were, an entirely new charging system would be required to correctly charge them. For now we must be satisfied with lead based batteries for our energy storage needs. This does not leave us without choice. There are a number of recent developments in lead based battery technology. Absorbent Glass Mat batteries have been slowly improving in the last few years and sales of the so called Gel battery have now exceeded the numbers of flooded lead-acid batteries sold for use in motorhomes. We recently replaced the 6 year old, flooded (Trojan brand) battery bank in Hobohome and I was amazed at the wide selection of replacements on offer. I finally decided on a pair of 12 volt 230 amp hour (ah) gel batteries. These batteries are larger and heavier than the Trojans, they cost over $500 more and they are rated only 5ah above the batteries removed – so why did I select them? Before I answer that, let’s first discuss battery capacity. Battery capacity is measured in amp hours. One amp supplied for one hour will deplete a battery by one amp hour. One hundred amps supplied for two hours will deplete a battery by 200 ah. From this, you would expect a 225ah battery to happily deliver 225 ah of power every day – right? Wrong! Flooded batteries (like a car battery) absolutely hate being deeply discharged. Deep cycle batteries have been designed to better withstand deep discharges, but it is true to say that if you want your flooded batteries to live beyond a few cycles, you had better not ask them to deliver much more than about 50% of their rated capacity. Suddenly our 225 ah batteries are only really able to provide us with 112.5 ah of usable energy. The life of a battery can now be calculated and is a factor of the number and depth of discharge cycles. The deeper the discharge, the fewer cycles a battery will be able to deliver (for a motorhomer a cycle represents a day of charging and a night of discharging. So for full-timers like us, 5 years is 1825 cycles). Back to our new gel batteries – why did I select them? Simply put, they are able to supply far more usable energy by withstanding deeper discharges. It is not unreasonable to ask the gel batteries to provide over 70% of their rated storage capacity. That is over 160ah. If the average daily discharge was this deep (and ours is closer to 30%) the batteries expected life would be about 1300 cycles or 3.5 years. At our normal 30% discharge, the batteries should still be delivering power to Hobohome in 8 years. 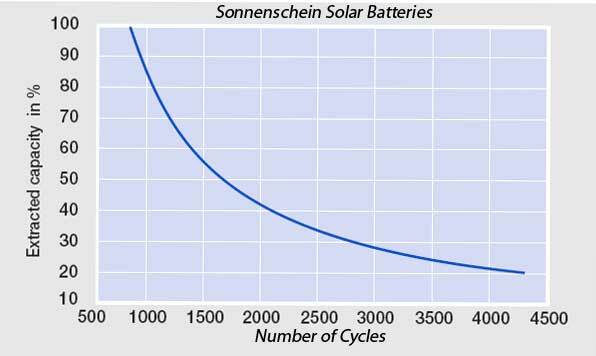 So the long life combined with the gel batteries ability to deliver more power on the days when the sun won’t shine, made them the best choice for our energy storage needs. Has the information on this site been useful? If it has, please consider using the donate button at the bottom of our home page. All donations are used to maintain and improve the website and we are very grateful for any support. Do you offer a product or service that relates to caravanning or motorhoming? Would like to tell the thousands of people that visit Hobohome.com each week, about your product? We are also looking for new products to review. This entry was posted on Friday, February 27th, 2009 at 9:11 am	and is filed under Caravan, Motorhome, Power, Solar, Technology. You can follow any responses to this entry through the RSS 2.0 feed. You can leave a response, or trackback from your own site. Hi there Gavin, i have just stumbled across your web site….must say you have developed a great resource here, congratulations! Have just read your article on selecting house batteries. We have just bought a bus (24v), and are in the process of setting it up for our trip around Australia. I am at the point of selecting house batteries, and am considering LI or Flooded LA. I am looking at Fusion 100 Ah LI x 2 or Trojan 225 Ah LA x 4. In your article, you indicate LI is not readily available. My recent research indicates LI batteries are more available now and appear to be superior in all respects to flooded LA batteries, (except for the up front outlay!). In talking to the vendor of Fusion LI batteries, they indicate that they can be “dropped in” in place of any LA battery, and will happily be charged by an alternator, a charger or panel etc, set up for LA batteries. Do you have any recent experience of LI batteries, and can you comment on these claims? Interested to know what you think about LI vs LA. I currently have no first hand experience with LI batteries in motorhomes. I do feel that they are are way of the future. I have a friend in NZ who has one in his motorhome and has had no issues with it. I do have a problem with manufacturers who make claims of huge life expectancies but provide a warrantee of just 12 months – this is not putting your money where your mouth is. I think I would consider lithium only if they were branded with a known big name AND they had an impressive warrantee to match the asking price. I feel that AGM is probably the best option for now. I have a 1999 Toyota HiLux and have just bought a small Jayco StarCraft caravan. The caravan will have a 150 watt solar panel and a 100 ah rated battery. The HiLux already has a second battery on the tray and Redarc controller under the bonnet and a Bushman compressor fridge. The Waeco fridge in the caravan has a Danfoss compressor. The ute has 8mm wire from the main battery to the second battery and to an Andersen plug that connects to the caravan so there is 8mm wire straight through to the caravan battery. There is 8mm wire from the caravan battery to the fridge. Since much of the charge will be coming from the ute’s alternator and all three batteries are connected I guess I am stuck with old fashion lead acid batteries. I do not intend to use caravan parks very often. Before I hit the road I will buy a 2000w Honda generator and smart battery charger. I got a fairly expensive control panel built in to the van at the factory that is supposed to let me know the state of charge of the batteries. It is reasonable to have lead-acid crank batteries and AGM house batteries that become interconnected when the vehicle alternator is running – I don’t see a problem with that. As the alternator will not charge the house battery to 100% – the Solar will be required to top it off. Don’t mix AGM and LA batteries for the house system. If the control panel actually tells you percentage of charge and amp-hours remaining, it will be worth the money you paid for it – if it just tells you battery voltage, it is next to useless for determining the real battery capacity. I have just had to replace 4 x 120ahr wet trojans after 2 years of very low cycles I sent them back and was told only 30% left last time I will use those and these batteries had a very careful maintenance program with only very light cycles Warranties not worth anything anymore. I have been a big fan of Trojan batteries in the past. I’d like to know more about the issue and what the company had to say. What if I was to ask the question everyone asks but backwards? Just doing up an old coaster, what will 200watts and 200amp hours run for me? I have a little 3 way but prob wont run/travel with it. I have low current small fluros and a led light or two. Radio, cb just a few things but want a small tv. Any reason not to stay at 200w and 200 ah? A 200w solar panel will produce about 70 amp hours per day. This will of course depend greatly on where you are and the time of the year – but 70ah is a good average. This means you can use 7 amps for 10 hours OR 70amps for 1 hour. The items you mention are all fairly small users of power (with the exception of the TV unless it is a very small modern LED TV). They are also not likely to run 24hrs per day (like a fridge). So without having all the exact current ratings – its just a guess, but my guess would be that you are going to be just fine. Your very informative site and clear explanations are a great resource. My respect for you tripled when I read that you guys are cat lovers and travel with them. Not for the faint of heart! Have you seen the loc8tors? Cheap well, affordable. Rf based so very small, a little battery hungry but work well and have great range for finding, locating, and directional information on our loved pets. Designed for luggage but adapted for pets they work well for cats. I have one but no connection to the company, and its nice to press a button and find out how far and the direction of my favorite companion. Peace of mind is worth the effort. Will endeavor to read all I can and learn by osmosis your great experience of low voltage. Happy travels. Ps Tivoli still with you? We have a Loc8or on each of the cats. They are great and we are very happy with them. We find if you buy the batteries in bulk (eBay), they are not too bad. Being RF, they do fail a bit around large metal structures (like a big metal shed). I have just been looking at another device (called a “tk-star”) that has GPS and GPRS allowing for the setting up of a virtual geo-fence. Of course this does not work in places without mobile network coverage (and is quite costly to run). These require charging every night. Still researching. If you travel with cats – be aware the WA is now trialing the first poison bait system designed to kill cats (cats won’t touch most baits – but apparently they can’t resist these). Sadly we lost Tivoli last week (nothing to do with baits) – she was 15yo (not super old for a Burmese) and has been traveling with us for over 12 years. Hi Gavin, I have read a lot of your forums about solar and batteries and cabling etc etc etc. So here a few questions. In the article “What appliances can I run……” dated Nov 9 2013 you said you were running six 8 volt golf buggy batteries but in this article you say that you have just replaced the batteries with a pair of 12 volt 230 ah Gel batteries after 6 years of service from the old batteries. Did I miss you changing batteries again? On another note I am slowly working on putting together a solar array. I purchased 2 second hand Suntech panels, model STP185s-24/Ad, P max 185w. 5.09A I mp, 36.4v V mp, 5.43A I sc, 45.0v V oc. The guy I got them from said they are ex house panels. Paid $120 each. I have room on the roof of my bus for at least 6 of these panels so that would “give” me 1110 watts. My bus is 24 volt so I want to run 24 volt house power. So next question, Jaycar and RTM have an MPPT solar charge controller with specs of Max input power 1300 w (24/36/48VDC), input voltage: 16-95VDC, Max charging current 50a (12/24VDC). Do you think this MPPT would handle the panels I would like to put up? This is still in the planning stage as finances dictate progress. I know that I haven’t said what I want to run but that would most likely be 24 volt fridge (Evacool possibly) LED lighting basically set up for free camping. The 8volt Trojan golf buggy batteries replaced the 12v gel batteries that lasted just 18 months – both the manufacturer (Sonnenschein) and the supplied refused to respond to my emails about this. The8 volt batteries are still in service in the motorhome today. The 8 volt version was selected purely due to size restrictions – the 6 volt versions (T105) are a better value proposition – and these are the batteries we currently use in our shouse power system (24 of them). I was also offered some second hand solar panels that had been removed from a house. The story I was told was that “they were from an upgrade”. I did a lot of digging and found that the actual truth of the matter was a little different. The panels were removed from a house, but not to allow for an upgrade. They were removed because they had developed a fault or were not performing to spec. The supplier had made a claim and had them replaced – the installer was selling them off as a sideline. There are currently hundreds of panels link this for sale around the area we live. I’m not suggesting that they are not a good buy, but buyers should be aware of their history . I have no direct experience with the controller you mention, but the specs suggest that it will do the job – can I recommend the BlueSolar regulators by Victron – these are great. Hello again Gavin. Thank you for the information. It is very helpful with my planning. I just reread the last paragraph of the blog and why you got the Gel batteries. I would have been using stronger language than yours. I have been to a couple of local battery dealers here in Rockhampton to enquire about the Trojan T105s and one place was very helpful, The other place is best left there. The BlueSolar looks good. But I will keep looking and budgeting by the time I have the money maybe there will be more advances in the technology. Hobohome and her crew have been travelling Australia for 15 years, 9 months, and 26 days. If you would like to ask a question or make a comment relating to this or any other Motorhoming / Caravanning topic, we would love to hear from you. Enter your question/comment as a reply at the bottom of the appropriate article. Email us directly. Our email address can be found on our contacts page.